A gift for that special moment, this book is a collection of prayers and verses specially chosen for a child's Christening. Classic prayers and Bible passages in a stylish gift package - the perfect christening gift; A beautiful, classic book to be given as a special christening gift. The themed arrangement of Bible passages and classic prayers makes this a book to be used and enjoyed by the child when they are old enough. The book also includes a keepsake element for the parents to fill in as a personalized record of their child. 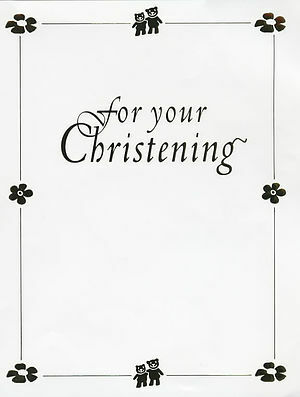 For Your Christening by Sarah Medina was published by Lion Hudson in February 2002 and is our 7414th best seller. The ISBN for For Your Christening is 9780745947785. Be the first to review For Your Christening! Got a question? No problem! Just click here to ask us about For Your Christening.